2. A Masters in GIS while working at his lab. That one sounds pretty great. 1. I kinda really want to be done with school. Tho that may be because I'm not at all interested in most of my classes and maybe at grad school it will be different becaause it will be a specialty I like? 2. I don't know if I can get in. The requirements usually say you need a GPA of at least 3 and 3.5 is preferred. When I studied Aerospace Engineering here my GPA started to slip a lot because it was really hard, I lost interest, then had to withdraw due to meningitis. So my current GPA is about 2.7 something. Since I returned and changed majors I've gotten almost all A's so my major GPA is about 3.2 but I'm not sure if that matters. 3. I need 2 or 3 letters of recommendations from professors who can vouch for my abilities. I've never really talked to any professors here. If I had gotten that internship that might have gotten me 1, but I never heard back. Today I need to talk to an advisor at my school anyway so maybe I'll ask them what they think and what they know about this field and grad school. Maybe I'll look over the mapping center website again or email him asking what kind of things I'd be doing. Also, at the community college where I first got into GIS I had a great teacher/advisor who was very supportive and helped me get my first internship and jobs. I haven't talked to him in years but maybe I should reach out and ask his advice? I think it really depends on what you want to do. I know nothing about your field so I’m not sure. For me, no, grad school wouldn’t be worth it. To expand, how many jobs are actually available in that field? The only way that's remotely worth it is if you have a real guaranteed job at the end of school (like if your current job was sending you to grad school for a promotion). The mouse is right; be sure you know what the real opportunities would be post grad school. If there aren't many job openings in that field, I'd say it's not worth it. I don't directly know what GIS is used for other than what my company uses it for (mapping borings and groundwater plumes), but I assume there are many possibilities. There are boat loads of GIS jobs out there. If you can get a GIS certificate you should be well positioned for employment in a number of fields across academia, government and industry. If you can do it while also learning something you’re interested in even better. I. Terms of getting in, letters of rec are more important than GPA and depending on the program you may also need the support of the professor you will work with. It sounds like you’ve already crossed that bridge. I wouldn’t let GPA stop you from applying. Everyone understands switching out of a major you didn’t really like and then improving; typically you can address these sorts of things during the personal statement/essay usually required of applicants. Which professor - Professor Bucher? I kind of forgot that I went to school with and studied classics with your brother...such a small world. Holy sh*t yes! Wow that is crazy. Wait did you actually know my brother?I have no memory of this. There are f*cking tons of jobs for GIS. But most in fields I'm not interested in at all. Lots of people at my school are pushing their new geospatial intelligence masters program saying you can make so much money. And so many of the jobs I see listed are for urban planning or land use or agricultural monitoring. I've seen a few archaeology related GIS jobs but from the sound of it they're more interested in archaeologists with a GIS certificate, or even that have just taken GIS courses. 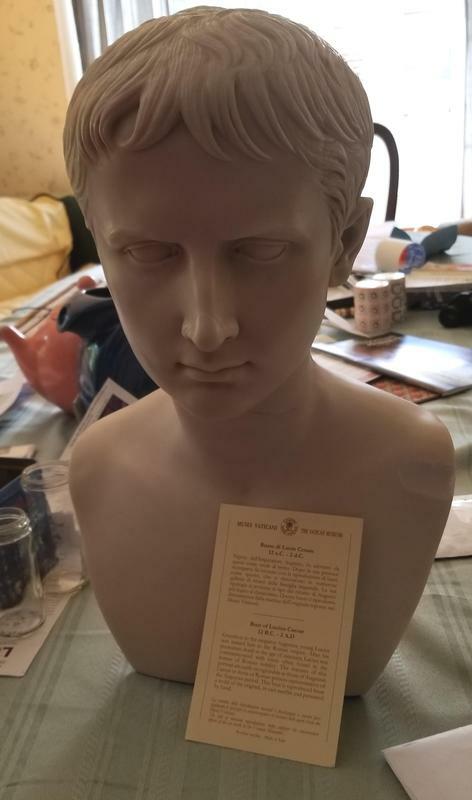 This is the $400 bust he sent my sister. Unfortunately, the sculptor must have messed up because it doesn't look anything like me so I had to destroy it. Yep! I believe he was a year ahead of me. The classics department at our school wasn't exactly big so everyone knew everyone, lol. Professor Bucher was the best. And yeah I believe we briefly discussed me knowing your brother a loooooong time ago. I just kinda lurk around here so I don't blame you for forgetting. We could have talked everyday for years about this exact subject and I'd still have no memory of it so no worries.